We also offer on-site training. Gather a group of 8 or more and we’ll come to you. We can accommodate any size group and we have worked with some of the largest companies in Knoxville. Flexible Schedules– We offer classes consistently all over Knoxville and the surrounding counties. Our Knoxville Training Center schedules classes each week & offers weekend options too. We can also accommodate any last minute training needs. With our organizational structure, we can offer classes for any shifts for your employees and/or businesses. Starting July 2015, we will also be adding ACLS (Advanced Cardiac Life Support) and PALS (Pediatric Advanced Life Support) to our curriculum. Continue to check our website for new class offerings, www.cprchoice.com. We make it FUN! We deliver quality training with the most experienced instructors in the area, boasting a combined 85 years’ experience in CPR and safety training. Our staff members are passionate about their job and incorporates their real-life training knowledge into the class room offering a fun, engaging and informative experience. Visit our website www.CPRChoice.com to learn more about our locations, classes and our team! We would love to see YOU in a CPR class soon! The American Heart Association (AHA) has two simple tips for anyone around you that goes into cardiac arrest. Call 9-1-1 and push hard and fast in the center of the chest to the beat of the classic disco song “Stayin’ Alive”. 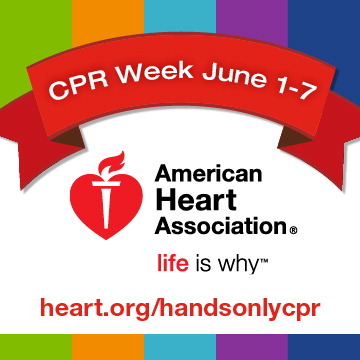 Cardiopulmonary resuscitation or CPR can more than double a person’s changes of survival, and “Stayin’ Alive” has the right beat for Hands-Only CPR (www.heart.org). The 1977 Bee Gees’ song has the perfect beat for performing CPR because the song contains 103 beats per minute. This is close to the recommended chest compressions of 100 beats every 60 seconds. This campaign introduced by the AHA has created a series of videos available on YouTube to help spread the word. Ken Joeng, an actor, comedian and also a licensed physician in CA stars in one of the promotional videos and urges people to pay attention. CPR courses are so important and it is crucial that every American learn these skills. Sign up for a class today! CPR Choice offers classes that are fun and engaging and allow each student lots of hands-on experience. Do not hesitate to learn CPR, you could make a difference, you could save a life! We offer classes for anyone! Including: BLS for healthcare providers, Heartsaver CPR & AED, and Heartsaver First Aid. Am I Liable if I give CPR? Almost every day, someone shares their concerns and fears of being held liable if they were to give CPR to a bystander. It does seem like people can be sued for almost anything these days. Have you read about consumers suing restaurants for causing them to be overweight? Or criminals that sue their own victims for injuries caused while committing the crime? With this sort of litigiousness being prevalent in our culture, many people tend to be cautious with their interactions with others. When it comes to giving someone CPR or first aid many fear their liability. What happens if they break a rib or if the person isn’t resuscitated? In the state of Tennessee there are protections in place for those who are, in good faith, attempting to provide assistance during an emergency. Most states have these safe guards in place, they are usually referred to as Good Samaritan laws. The rescuer must be acting in good faith. This means he or she is providing care to the person without any motive other than saving the person’s life or keeping them from further harm. They may not receive any rewards or monetary donation. The situation must be a potential life-threatening emergency and the care must be necessary to treat the injury. Examples of life saving treatment are giving CPR, applying pressure for blood loss, giving rescue breaths, providing first aid or performing abdominal thrusts to a choking victim. Care must be provided on a voluntary basis. The caregiver must not have legal obligation to provide help nor can they be paid for providing assistance. A healthcare provider (i.e, paramedic, nurse, physician) that is on duty is not protected under Good Samaritan laws. However, a healthcare provider that stops at the scene of an accident and provides first aid (while not on duty) IS protected. You may not commit gross negligence. The caregiver must not deliberately act in a way that would cause harm to the victim. This could include performing skills that you are not trained to perform. The best way to protect yourself is to get certified in CPR and First Aid by taking a class from an authorized training center. Keep your certification current, most certifications last 2 years. As long as you are acting with true intentions of trying to save someone’s life, you are not held liable. If you have not been trained, please call 911 and get an Automated External Defibrillator (AED)! Health care providers and other persons administering emergency aid are not liable. Any health care provider licensed or certified to practice as such in this state or elsewhere or any other person who renders emergency care at a public gathering or at a scene of an emergency occurrence gratuitously and in good faith, shall not be liable for any civil or other damages as the result of any act or omission by which person rendering the emergency care, or as the result of any act or failure to act to provide or arrange for further medical treatment or care for the injured persons, unless such person, while rendering such care, is guilty of gross negligence. To read the entire Tennessee Good Samaritan Act, click here. Many people feel uncomfortable putting their mouth on a stranger’s mouth. I can relate to this. The first time that I ever gave CPR it was to a hitchhiker on the side of the road that I witnessed having a heat stroke. I did not know him and would not have wanted to put my mouth on his. Luckily for him, I have an entire trunk full of CPR arsenal but most people don’t. Hands only CPR was developed so that bystanders could feel comfortable doing something and doing it quickly. Most people that experience cardiac arrest out of a hospital setting die because they do not receive immediate CPR from someone at the scene. Hands only CPR is easy and anyone can do it! Hands-Only CPR is recommended for teenagers and adults. Cardiac Arrest is the leading cause of death in America and immediate CPR can double your chance of survival. We already have a fair amount of oxygen in our blood and in our lungs. When someone isn’t moving they aren’t using much of that oxygen. This allows a few minutes for our bodies to use up all the stored oxygen until help arrives. Also, a small amount of oxygen is passively pulled in and pushed out with every compression given by a rescuer. The Hands-only approach is not recommended for infants and children as they rarely experience cardiac arrest. If someone has stopped breathing due to drowning, choking or severe asthma they would still need mouth-to-mouth ventilations as well as chest compressions.